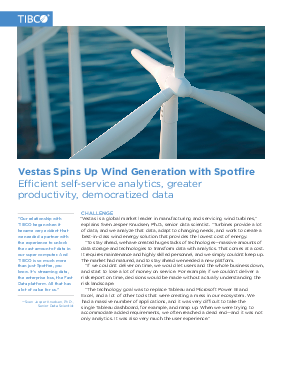 “Vestas is a global market leader in manufacturing and servicing wind turbines,” explains Sven Jesper Knudsen, Ph.D., senior data scientist. “Turbines provide a lot of data, and we analyze that data, adapt to changing needs, and work to create a best-in-class wind energy solution that provides the lowest cost of energy. “To stay ahead, we have created huge stacks of technologies—massive amounts of data storage and technologies to transform data with analytics. That comes at a cost. It requires maintenance and highly skilled personnel, and we simply couldn’t keep up. The market had matured, and to stay ahead we needed a new platform. “If we couldn’t deliver on time, we would let users and the whole business down, and start to lose a lot of money on service. For example, if we couldn’t deliver a risk report on time, decisions would be made without actually understanding the risk landscape.